Add your own flavor to this classic snack. As children we loved a bowl of Chex for breakfast, and in middle school Chex Mix was on every table at those PG-rated parties. Now, in college, your childhood favorite is coming back but with your own personal twist. 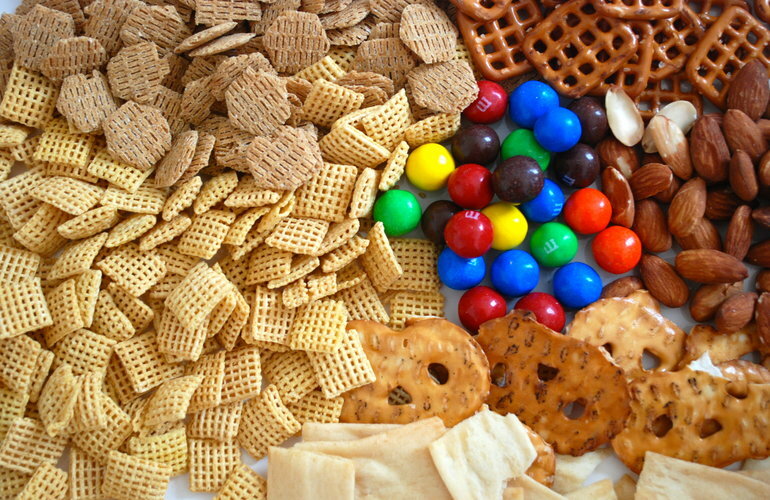 Every Chex Mix recipe consists of the four essential bases: Chex, pretzels, chips, nuts and candy. However, there are an infinite number of combinations of ingredients to construct a Chex Mix personalized just for you. Using my favorite things on the grocery store shelves I made my own Chex Mix with Snyder’s Butter Snap pretzels, Stacy’s Pita Chips, Snack Factory Pretzel Crisps, Pretzel M&Ms, roasted almonds and a salty sauce. A big batch of homemade Chex Mix is perfect for a gathering of friends or in single servings as a daily snack. Choose one (or more) options from each of the columns below and then choose a salty or sweet sauce. Time to get creative.